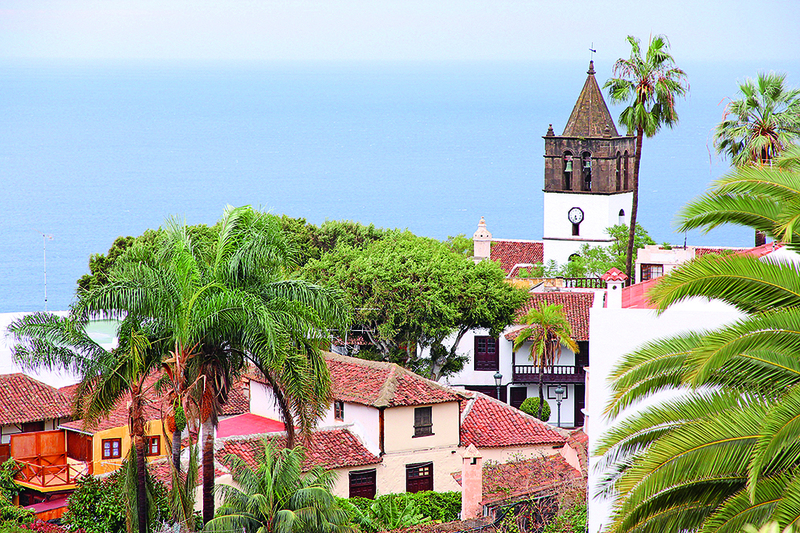 Puerto de la Cruz, at the foot of La Orotava Valley on Tenerife’s northern coast, has a year-round balmy climate that allows lush subtropical vegetation such as hibiscus and bougainvillea to flourish. Its sheltered position made it the obvious choice for development when cruise ships began to stop here. 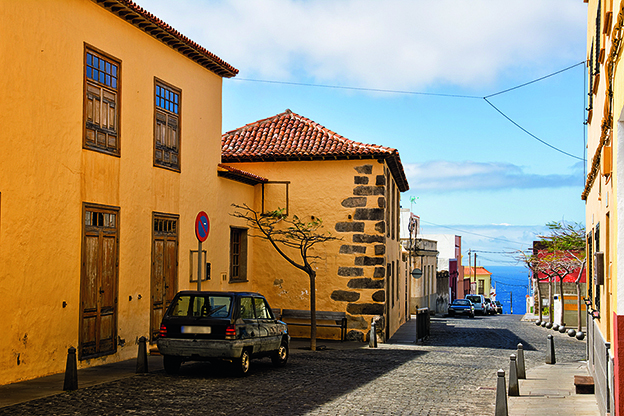 Today, it retains plenty of mid-20th-century glamour yet remains Canarian in character. The oceanfront has wide boardwalks fringed by palm trees and black-sand beaches. Quality hotels and restaurants, extensive shopping and the rather laid-back atmosphere mean you’re as likely to mingle with well-heeled locals as with tourists and there is plenty to entertain for short or long visits. On a hot day it’s worth heading to Lago Martianez, a chic complex of saltwater pools, floating islands and fountains. The park is well laid out with great facilities so you never feel crowded, even in high season. You can spend all day for a modest €5.50 (£4.90) entrance fee. A 20-minute drive west from Puerto de la Cruz, this traditional city is surrounded by banana plantations, orchards and vineyards. 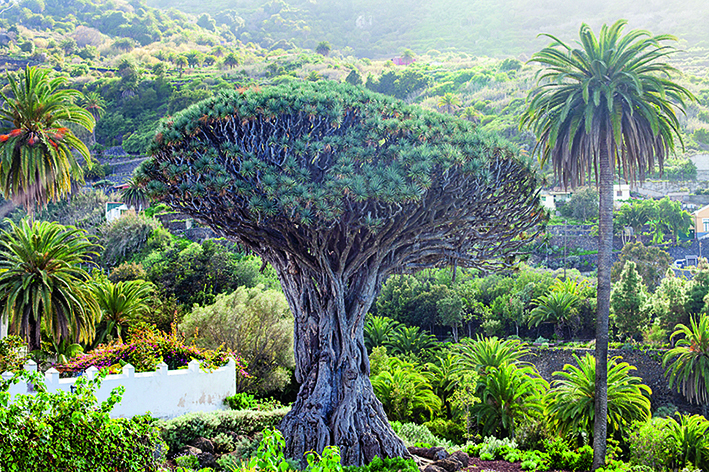 Founded in 1501, it also boasts the famous Dragon Tree, reputed to be around 1,000 years old. The area’s pretty, narrow streets are flanked by traditional local shops that curve their way down to Plaza de la Pila – said to be one of the most beautiful squares in the Canaries and one with its own botanical garden. A favourite weekend destination for locals, this coastal town comes complete with a sheltered volcanic-sand beach. The atmosphere is relaxed and there are a number of decent restaurants and bars as well as a small beach hut. The cove is protected from the worst of the weather and is always warm. You can also sit and watch the local fishing boats being winched in and out of the sea, and if you are brave, you can buy some fish directly from the fishermen as they land. Nestled at the foot of a 500m cliff lies this 18th-century town complete with an old fort on the seafront and paths through the attractive and unusual lava rock pools. The dark sand beach in the small harbour is protected from waves and safe for swimming. The old streets are genteel and exploring them reveals ancient convents, monasteries, colonial buildings and historical quirks as well as upmarket boutiques and good-quality restaurants. This large volcano is technically active – though it hasn’t erupted since 1909. 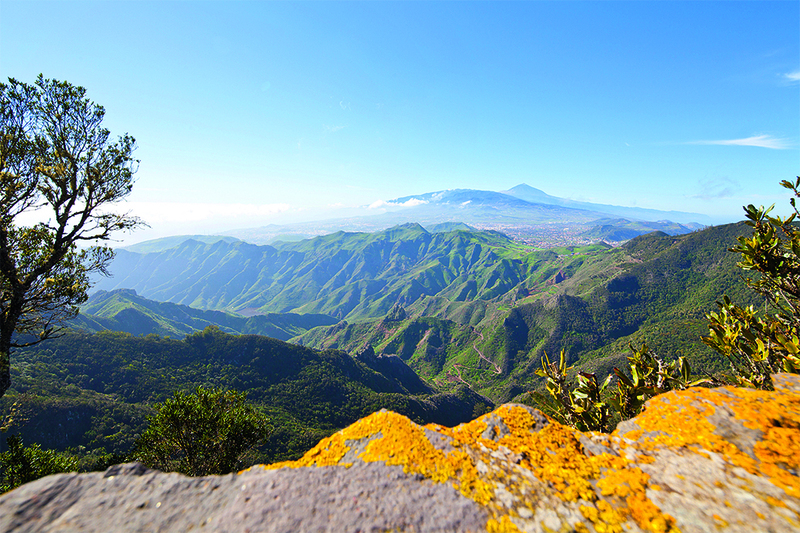 It dominates the Tenerife skyline and can be seen from the nearby islands. The highest point in Spain, there is often snow at the top, even if it’s hot enough to swim at the coast. It’s a popular destination for a day trip for tourists from resorts across the island, and there is a cable car to the top, which is worth taking for the views if you’re not really a hiker. The whole area has much to explore, however, if you do like to hike – there are 13 mountain trails on offer, ranging from moderate to difficult. If you’re planning on staying a few days, look into getting a room in a state-owned paradorin the National Park. Paradorsare known for having a high standard of service for much less than you would expect to pay. 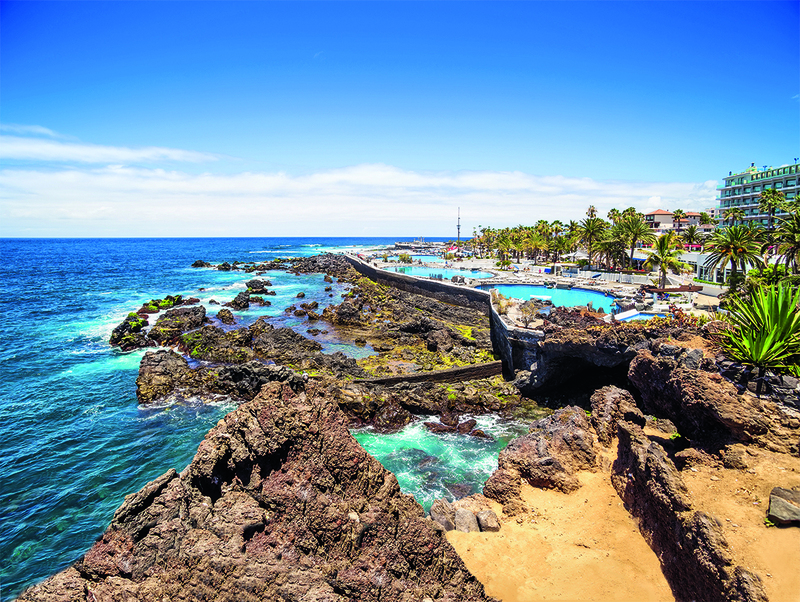 As Tenerife’s vibrant capital city, Santa Cruz has everything you’d expect of a thriving metropolis, from art galleries and museums to bustling markets and the rather spectacular Auditorio de Tenerife, which is reminiscent of Sydney’s Opera House with its stunning avant-garde design and offers a wide variety of programmes including rock, pop, opera, jazz and so on. North-east on the TF-11 lies Las Teresitas, a mile-long palm-fringed golden beach made entirely of sand imported from the Sahara. This natural park is the underdeveloped part of the peninsula north of Santa Cruz. There are few roads but the TF-11 and then the TF-12 will take you on a beautifully scenic drive through the area; the roads are quite twisty with some steep curves to navigate. Head for Taganana and stop for lunch and some breathtaking views of laurel forests – don’t forget your camera! Tenerife is a walker’s paradise but you must take a sturdy pair of hiking boots as the ground is often quite loose due to the volcanic nature of the soil. Sticking to paths is a good idea to avoid loose gravel and steep falls. Always take water with you to stay hydrated, even in winter. For ideas and advice on planning your route, see walkingtenerife.co.uk. If you love seafood you’ll be in heaven here. There are fish restaurants wherever you go and as this is an island, you’re pretty much guaranteed freshness. Roadside cafes are often very good value, even the ones on the side of petrol stations, where you’ll find really good snacks and tapas. Keep your eye out for guachinches, basic restaurants that serve delicious grilled chicken and fish cooked in traditional ways in an oven in the room, along with inexpensive local wine. Whatever you order in Tenerife you will get two little pots of the local mojo, one green and one red, which is usually the hotter of the two! Every family has its own recipe for each, so they can vary widely. They go really well with papas arrugadas– little local potatoes cooked in their skin in salty water. Carne cabrais a goat stew which is cooked long and slow so is melt-in-the-mouth delicious. End your meal with a ron miel, a rum and honey liqueur, on the rocks or straight – it’s sweet and very moreish! The adults-only Hotel San Roque in Garachico has 20 romantic bedrooms, all of which contain vaulted wooden ceilings, double beds and whirlpool baths. The swimming pool is hewn from the island’s volcanic rock and heated year-round, while the Anturium restaurant sets up round its edges at nightfall. B&B double rooms cost from £151 a night (00 34 922 13 34 35, hotelsanroque.com). Parador de Las Cañadas del Teide in the National Park is a traditional mountain lodge with spectacular views of the volcano. State-owned, it is very comfortable and extremely good value for a few days’ stay. There is even a telescope for stargazing at night, which is very fruitful here as there is hardly any light pollution. B&B double rooms cost from £93 a night(00 34 922 38 64 15, parador.es). GETTING THERE: Fly direct to Tenerife South Airport from all major UK airports with British Airways, easyJet and Ryanair, all of which offer scheduled flights of around four hours. Then hire a car or book a transfer to make the 90-minute journey across the island to Puerto de la Cruz or the 45-minute journey to Santa Cruz.